This time last year, my life was on track. I was almost at the end of a year volunteering in Timor. I was looking forward to starting my masters in Occupational Therapy, and I was coming home to an exciting new relationship. Life was pretty much as good as it gets for a twenty-two year old. But then came August, and with it my melanoma, and everything came tumbling down. While I was still in Timor, I’d found a lump under my left arm. Alarm bells went off straightaway. Almost a year earlier I’d had a mole removed from my left shoulder – a melanoma - so I knew to report not only suspicious moles, but also any lumps. This one was close to the primary melanoma. I didn’t waste time – I saw the saw the embassy doctor in Timor straightaway. She advised me to head straight home. Bags were packed and hurried goodbyes were said. It was great to see my family and friends, and Serge, but it wasn’t the homecoming I’d been looking forward to. Within in a week a biopsy was taken of the lump. 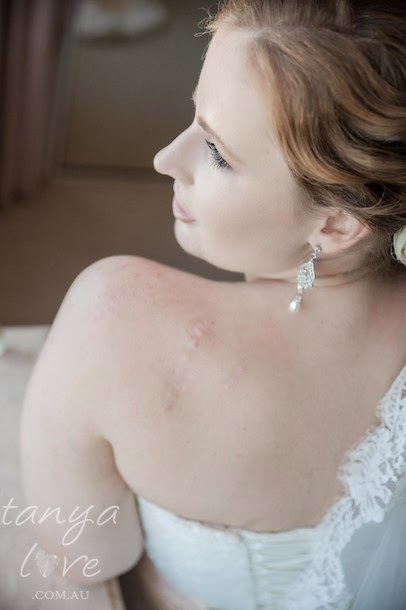 Although all the signs were there that this was again melanoma, nothing prepared me for what the doctor told me a few days later: my melanoma was back. I was sent to have PET scans to make sure it hadn’t spread further. Thankfully, they came back clear, but still surgery was booked to remove the lymph nodes under my left arm. Amidst all this, I was falling in love with Serge, whom I married two months ago. Our relationship had only just started when my melanoma interrupted. That’s a story in itself – and another blog post. But Serge was in the deep end with me from the beginning. I was at Stage 3, and there were big questions hanging over us - questions most twenty two year olds aren’t asking: Will I be able to start uni like I had planned? Will I ever be able to have children? And the biggest question of all, will I be here in five years? Based on the pathology of my lymph nodes, I was told that I had 70 percent recurrence rate in the next five years. 70 percent is huge for anyone, but definitely when five years would only take me to 27. I tried to be optimistic. There was a new treatment that had shown success in patients with Stage 4, and they were starting a trial to see if these drugs would stop Stage 3 patients from progressing. To be eligible for that trial, I had to have more scans to prove my cancer hadn’t spread. So, of course I did. If my world tumbled down last August, the news I received after those scans crushed what was left. The disease was in my liver. My 70 percent recurrence rate had changed to now only having a 10-15percent of being here in five years. My questions had been answered. I will not be starting uni. I will not have children. And chances are I won’t be here in five years. But I wasn’t giving up. How could I? I grasped any hope that was available. It was the beginning of a crazy three months. Scans showed the trial drugs weren’t working. The disease was spreading, fast. It wasn’t only in my liver, but my lungs, pancreas, spine, and in the subcutaneous tissue. I was given six months to live. One month after this news, there was a suggestion (based on more scans) that I might be eligible for a new trial. Again, scans showed the cancer had grown. If the trial didn’t work, I would be looking at three months. I’m happy to report that right now, the treatment is working. And when it stops working, I’ll jump onto whatever else is available. There’s no cure for advanced melanoma, but I know that these drugs can buy me time, and time is everything to me. HI Emma, Sorry I couldn't make your launch this morning. I would have loved to have been able to be there. I was diagnosed with a melanoma 2 years ago, and although so far I have been lucky enough to not have a recurrence, I really understand what you are going through. You are inspirational with your blog and the way you are trying to spread the message about early diagnosis.Never give up, and keep smiling! Emma! Your story has made it to Tucson Arizona where melanoma is on the rise! We are working in education every day! Your story is so inspiring! Thank you so much for spreading the word!! Thanks for your courage in sharing your journey Emma. Keen to hear what you think? Hi Emma...I stumbled across your story via 97.3FM facebook feed. Through this I made my way to your blog. I just wanted to say thank you to you Emma. Thank you for being the very beautiful young woman that you are & for publicly sharing your story. Your courageous attitude 'under fire', speaks volumes about you as a person. I'm so happy that your new treatment is working and I pray that it continues to do so. Keep hold of that fighting spirit & that fierce will to survive; it will serve you well. I also just wanted to say that I love your Winnie The Pooh quote ..it's also one of my favourites. Winnie The Pooh is such a clever little bear, with such a good attitude and attitude is a little thing that can make a big difference. I wish you all the very best Emma & will be keeping you in my prayers. From Bend Oregon, USA ~~ sending positive energy, tons of support your way! It takes incredible courage to share your journey with the world, it also requires an unselfish spirit ... the desire to educate and help others. I wish you success in fighting this cancer. wow...what a story...life changes quick doesnt it...i really appreciate your attitude in facing these challenges and not letting it crush you...i know there are probably moments that are so hard....but you are using your voice to make a difference in lives....and that is awesome...smiles. What an incredible, inspiring and brave woman you are... Thank you for sharing your journey. My husband was diagnosed with stage 4 melanoma earlier this and so far treatment has not worked, although hoping the next one will so he can spend time with his daughter. I too hope to help raise awareness and funds so we can beat this terrible cancer with cure. Stay strong and never give up. You have a gorgeous soul. Blessed be. Im sorry I will miss meeting you at the Melanoma Institue of Australia in Sydney. I hope we can be as inspiring as you. I have just been reading about you. I had melanoma on my face a year ago, it was surgically removed and clean margins declared. shows that mel has spread to my liver, lungs, bones and soft tissue.